Our Journey into Wellness: Bali trip is guided by local experts alongside your Pravassa wellness travel expert, our founder Linden Schaffer. This trip offers an exploration of Wellness Fundamentals; incorporating themes such as mindfulness, meditation, cooking, yoga, and cultural exploration into one holistic vacation. Join us for this 9-day wellness vacation in Bali, also known as the Island of the Gods. You’ll journey through a sacred ritual of self-care while surrounded by breathtaking natural beauty. Our time together will introduce you to the integrated mind-body-being modalities of meditation, mindfulness, nature, nourishment, silence, yoga, and more. As you touch down in Indonesia, you’ll breathe in the sweet air scented with frangipani, clove, and coffee, then meet the locals who will embrace you with kindness. We’ll begin in Ubud, the artistic hub of Bali, where the greenery and lush landscape give way to bustling streets filled with shops, temples, and locals weaving their way through. Then it’s up into the mountain village of Munduk. While surrounded by coffee and clove plantations, we’ll enjoy the serenity of connecting with nature and taking time for introspection. Pravassa is proud to have built lasting relationships with hotels and resorts which support the communities we visit and foster the concept of Fair Travel. Our handpicked, personally vetted accommodations showcase the best that each of our locations has to offer and ensure a curated and comfortable experience that supports your wellness journey at every step. During our Journey into Wellness: Bali tour, we’ll stay at intimate, locally run boutique properties where we can be fully immersed in the natural beauty of Bali while still experiencing the comforts of luxury travel. Highlights include: indoor/outdoor living, locally sourced building materials, traditional Balinese cuisine made with local ingredients, and award-winning spas. Our Journey into Wellness: Bali offers the option of a shared or private room starting at $5,300. Payment plans are available. Your wellness journey begins before you depart with the creation of an online community exclusive to your tour, which allows you to get to know your wellness tribe in advance of your trip. A copy of Living Well on the Road, Linden Schaffer's #1 best-selling book, which will guide you in preparing for wellness travel. Specially designed Indonesia wellness travel guide. Wellness tips and travel hacks. Phone consultation with our Wellness Experts. Access to our travel team to answer your questions and enhance your wellness travel journey. Upon landing, you’ll be greeted at Denpasar airport with an Om Swastiastu, the traditional Balinese greeting, and a welcoming smile from our local guide. Our group will then be escorted via private transfer to our first boutique Balinese hotel. After check-in, enjoy a Pravassa-exclusive welcome blessing ceremony—an offering of protection over your well-being and journey—conducted by the local priest. Together, we’ll dine on a curated wellness dinner before winding down in luxurious comfort after a busy day of travel. Wake to a freshly blended local juice followed by an AM yoga class to ground you in the lush Balinese atmosphere. 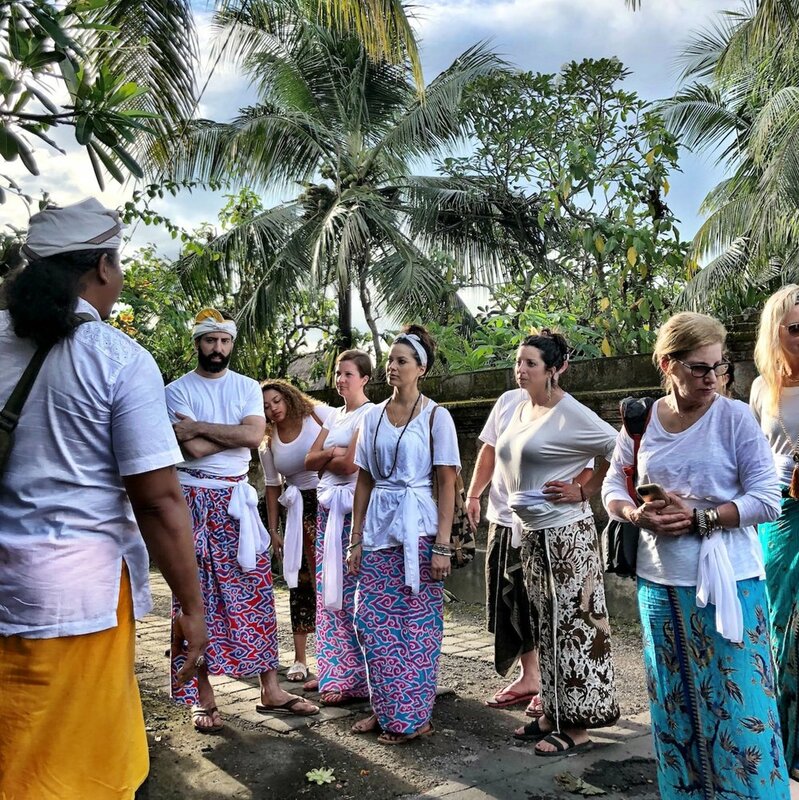 Following a delicious local organic breakfast we will enjoy a local village tour, providing you a look at how traditional life in Bali unfolds daily. After a curated wellness lunch, enjoy the afternoon at your leisure, exploring the grounds on a nature walk or taking a dip in the pool. Before sunset we’ll gather to experience a Kundalini Yoga class, incorporating dynamic breathing and meditation techniques to provide mental clarity and body balance. The evening will be yours at your leisure. *itinerary and all programming subjuect to changes and modifications. Pravassa has cultivated a global network of expert wellness practitioners, one of the many things that make Pravassa unlike any other travel company. In Bali, you’ll be in good hands with Pravassa founder and wellness travel expert Linden Schaffer, who has been leading trips to Bali for nearly a decade. Our local wellness guides include Balinese healers and mindfulness experts like Leah Santa Cruz, as well as yoga instructors and local guides eager to share the intimate details of their community, offering a deeper layer of immersive travel at every step of the journey. WHAT IS PRAVASSA'S WELLNESS PHILOSOPHY? WHAT MAKES PRAVASSA'S TRAVEL CONCEPT DIFFERENT? FOR FULL BALI FAQS, CLICK HERE.